It was all born out of desperation. It’s March, the dead time. As I seem to write on this blog every spring, we’ve reached the point in the year where we’re tired of eating the heavy winter dishes, but there’s really nothing fresh yet to speak of. It’s warmer, so we haven’t been craving a hearty stew full of meat and winter vegetables. Unfortunately, asparagus and fresh radishes — hell, even ramps — are still weeks away. I’d been complaining to everyone about being stuck in a culinary rut. I needed a change — any change. Enter the Jerusalem artichoke. I’d long been intrigued by these homely tubers, present on the shelves of the co-op throughout the winter and one of the few locally grown options at that time of year. But, other than that they come from sunflowers, I didn’t know much about them — and certainly not how to cook them. So I was left to look, to wonder, but not to eat. That all changed when the March–April 2016 issue of Cook’s Illustrated arrived at my door. 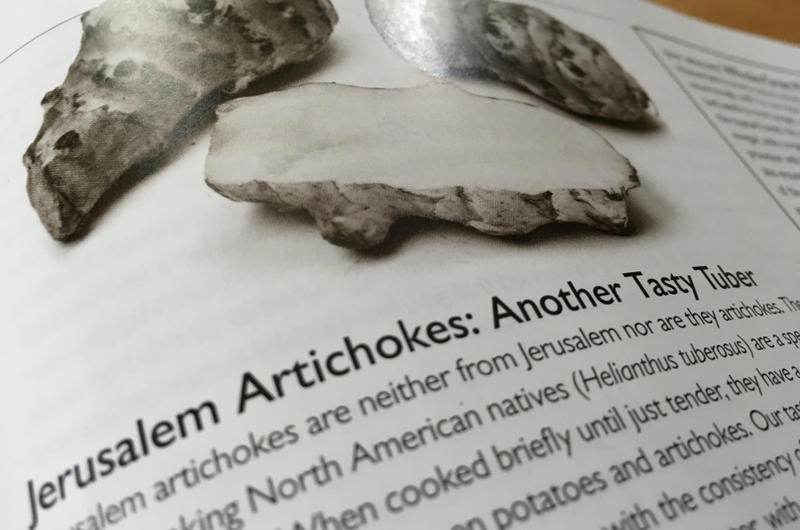 Buried in the back of the issue, under Ingredient Notes, was a two-paragraph offering from Lan Lam under the title “Jerusalem Artichokes: Another Tasty Tuber” with a little background on the vegetable, and, more importantly, instructions for how to cook the things. Armed with new confidence, I bought a pound. The preparation suggested by Cook’s was simple enough: peel the ’chokes, cut them into two-to-three inch chunks, brown them in butter, then add water, cover the pan, and steam for 25 minutes. This produced a relatively mushy vegetable — I think I’d have liked them a little firmer, though Lam writes that tasters preferred this cooked-sweet-potato-like texture. The flavor was pretty good; vaguely reminiscent of artichokes, maybe artichokes crossed with potatoes. I served them with pork cutlets. A few hours later, the first rumblings of trouble began. Rumblings in my gut. Rumblings that grew to be more than rumblings. Look, I’ll spare you the details, but let’s just say that by three in the morning I was up, out of bed, and re-enacting a certain climactic scene from the seminal ’90s cinematic masterpiece Dumb & Dumber. 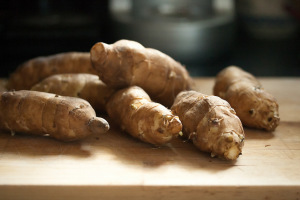 As it turns out, the Jerusalem artichoke is 76% inulin, a carbohydrate that, whatever other virtues it may possess, cannot be broken down by the human digestive system. That means it all just passes through you till it hits your large intestine, where various microbes are all too happy to feast away. And they produce gas. Potentially, a lot of it. Tasty tuber? Sure, I guess. But what else? This got me thinking about the ethics of recipe-writing. Didn’t Cook’s Illustrated have a duty to warn me about the hazards I was about to visit on myself and my family? But what about other health concerns? I usually appreciate Cook’s editorial restraint on questions of health, where the glossy food magazines are all too ready to hype up the latest trend: superfoods, paleo, whatever. The recipes in Cook’s do seem healthy in that they use real, basic ingredients, but the magazine stays away from claims that a dish or an ingredient will be good for you. But what about when an ingredient will be very, very bad for you? 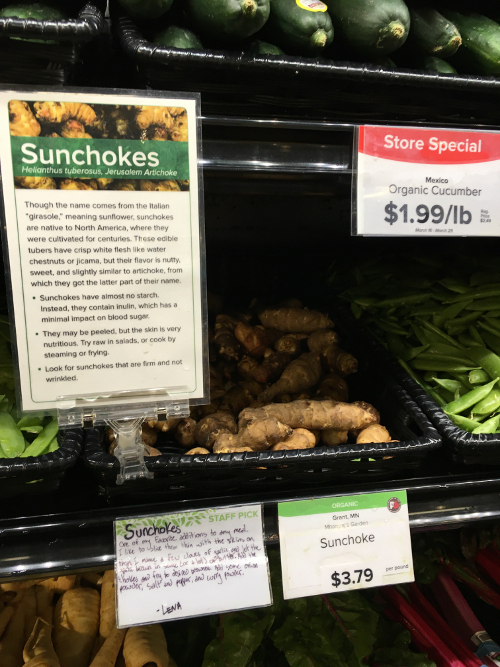 I still appreciate the information on Jerusalem artichokes provided by Cook’s — as I said, it’s a vegetable I’d long wondered about. But is it too much to ask for just a brief sentence in this admittedly short ingredient note, warning that the tubers were chock full of indigestible starch that may lead to gastrointestinal discomfort? Maybe a suggestion only to eat a small amount? Then at least I would’ve known to look into the issue before deciding whether or not to proceed with the recipe. Part of the problem is the vegetable’s unfamiliarity; with a recipe for, say, a big pot of beans, I know what I’m getting into. We’ll have to wait another month to see if Cook’s publishes a correction, addendum or retraction in the May–June issue. But until then, if you’re desperate for a new vegetable in your life, and Cook’s has never steered you wrong before, well — you’ve been warned. Lots of great information there, but missing the most important information of all. Caveat emptor. This entry was posted by Tom on Saturday, March 26th, 2016 at 10:21 am and is filed under Food + Drink. You can subscribe to responses to this entry via RSS. Thanks for the warning, Tom! Very entertaining to read about your experience!